Day two of having our rental car and we were ready to explore. Luckily our new friends the Barefoot Nomads were too. We heard there was a playground at a nearby McDonalds and so we decided to share breakfast with our friends, give the kids a good run around and then get on our way. The Barefoot Nomads are so cool, they had walkie-talkies - one came in our car and one in theirs. It soon became the tool for lots of fun dialogue for the whole journey. Our first stop for the day was Coba. 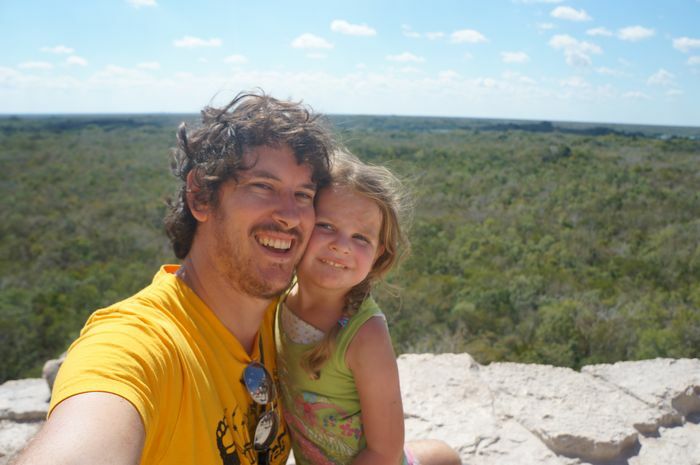 We were very excited, as it was our very first Mayan ruin. 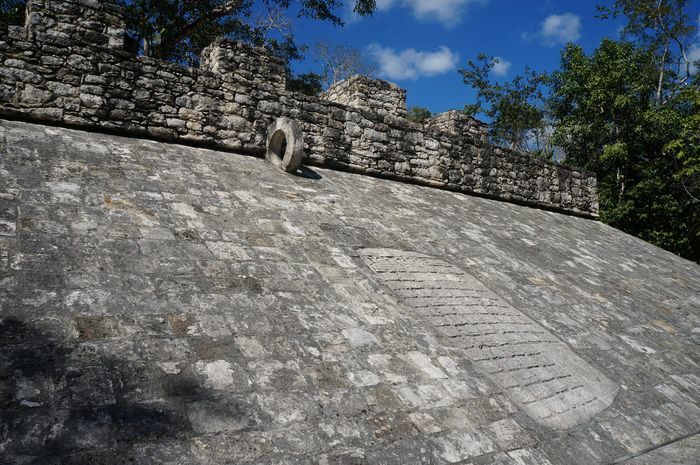 It is located about 90 km east of the Maya site of Chichen Itza and 44 km northwest of Tulum, with which a modern road connects it. 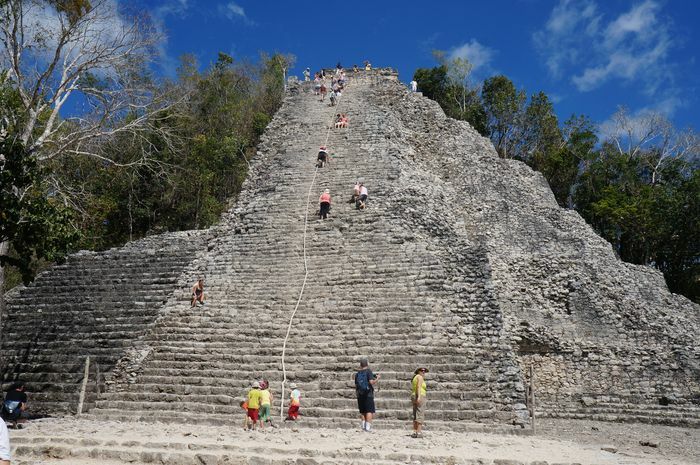 Archaeological evidence indicates that Cobá was first settled between 100 BC and 100 AD. 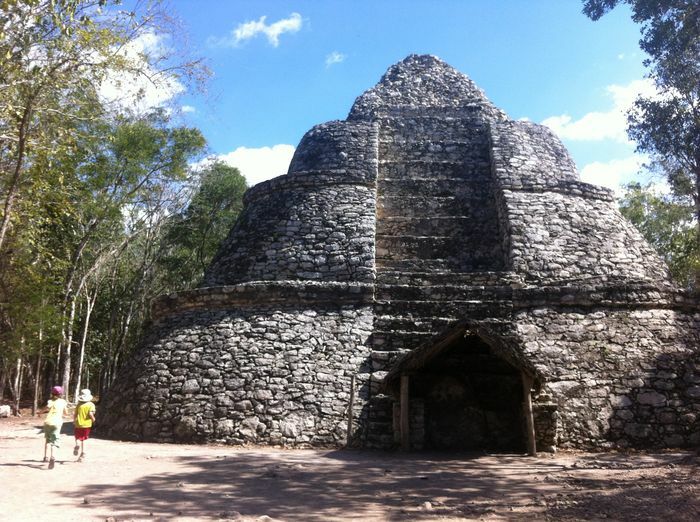 The site remained little visited due to its remoteness until the first modern road was opened up to Coba in the early 1970s. 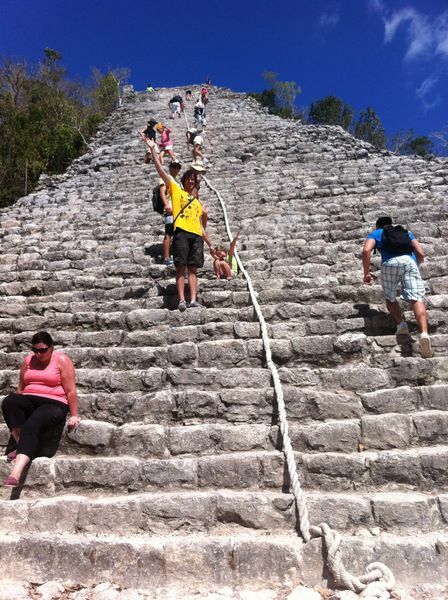 At the start of the 1980s another road to Coba was opened up and paved, and a regular bus service begun making it a popular tourist attraction ever since. Only a small portion of the site has been cleared from the jungle and restored by archaeologists. Entry to the ruin for 2 adults and 2 kids was $9. We walked around at the beginning before deciding to take a tribike towards the bigger temples. 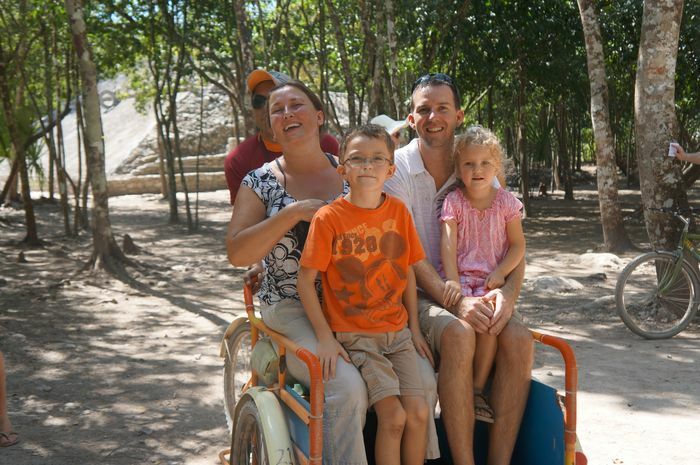 A tribike set us back $11 and was a fast and efficient way to carry toddlers around the large ruins. I wish they had them at Tikal. Although I have to admit feeling slight guilt over our cyclist, we gave him a good tip. You can also hire bikes too if you’d like to do the sweating. The road to the main pyramid was beautiful and a real adventure. 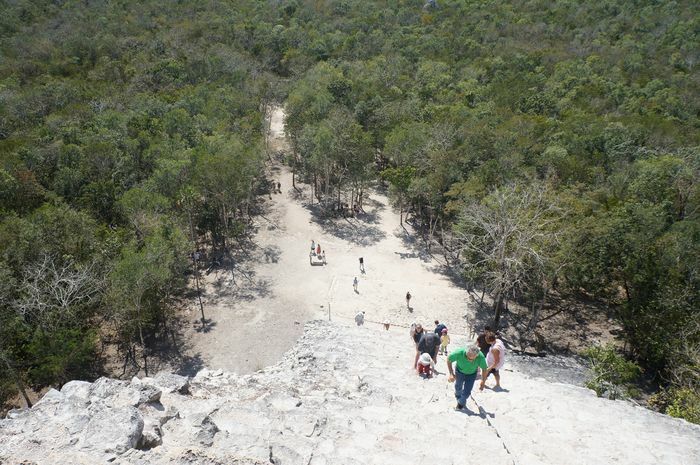 The final pyramid is known as the tallest in the Yucatán peninsula at 42 metres (138 feet) in height (based on Wikipedia). My 4-year-old daughter saw it and was determined to climb it. And up they went. I was so proud of her that day. I know a lot of parents that would be terrified of their kids doing this, but not me, I was delighted. 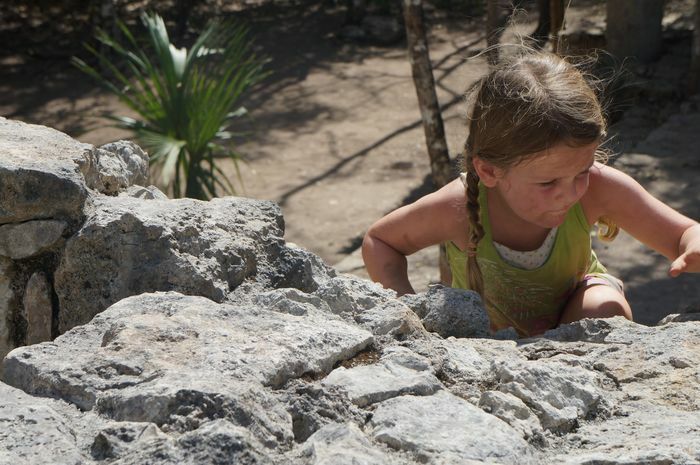 What other 4 years olds can claim to climb Nohoch Mul at 42 metres? Granted every other Mayan site we have been to since she has had no interest in climbing them again, and her legs were hurting her the next day, but she did it! I, on the other hand, was hot, sweaty and not nearly as inclined to climb that thing – I had a much better time climbing Lamanai. Our first Mayan ruin was extremely exciting and as breathtaking as all we thought it would be. Josh, my very tall husband, was enthralled with the Mayan basketball game that has the winners executed (the NBA has a few things to learn from the Mayans). 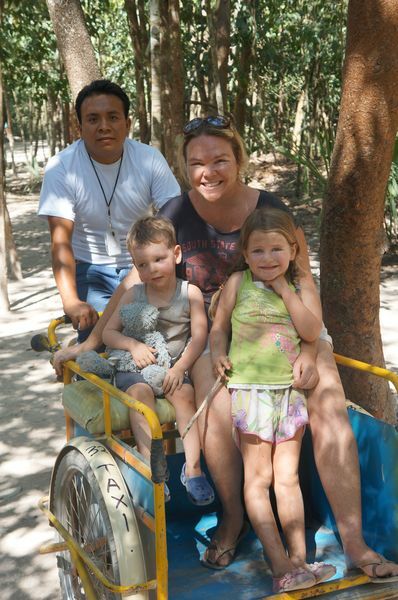 After our adventure at the ruins we decided to visit Tulum for fun at the beach. 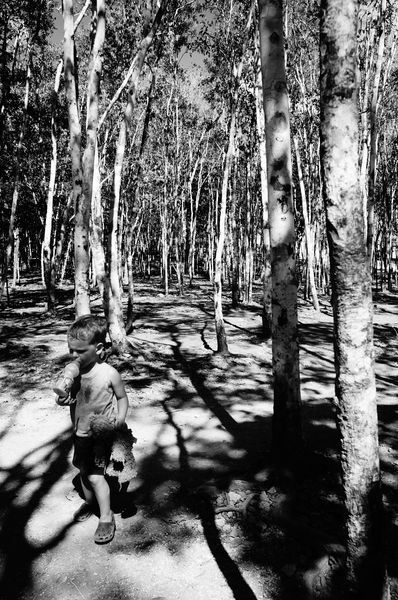 An morning filled with dusty old ruins had our kids more then ready for a wash in the cool ocean waters. Tulum is a little town, very hippy and laid back with some amazing beaches. We were pleased to let the kids swim and make sandcastles while us adults talked and shared our travel stories. The sun was setting when we decided it was time to head back to Playa Del Carmen. The goodbyes were quick as the mossies all of a sudden turned up in swarms. 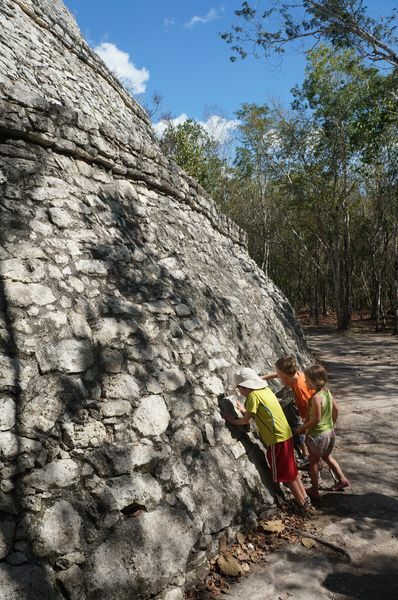 We stopped at a gas station for ice cream and then, with two fast asleep children, made our way home, enchanted with our very first look at the Mayan civilization and the wonder they left behind. 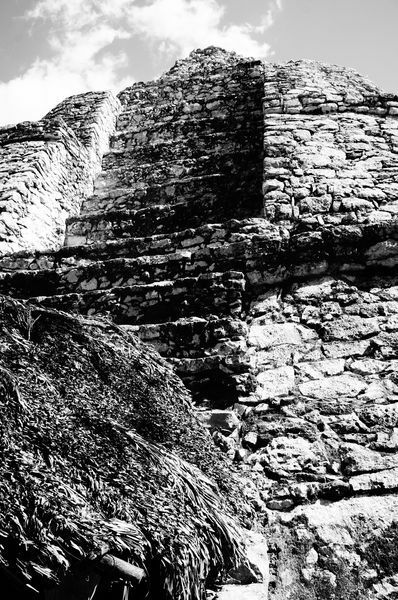 We have a great collection of Coba photos here in our photo journal as well as the famous Chichen Itza. Congrats! We were just there in February and I didnt even climb it! I was wearing cowboy boots and it was packed. So I opted to only go up a 1/4 of the way!